Great Tasting Instant But Is It Right for the Trail? Eggs in a Sierra Cup at South Fork Station. All that's needed is a good cup a joe. I admit I was intrigued by last week’s taste test offered by Starbucks. I’ve heard for months now that Starbuck’s new line of coffee – VIA – was not only like any kind of instant coffee ever brewed before, but that I wouldn’t be able to tell the difference between it and a cup of their full-strength java. Now, I’m thinking that you must be wondering what I’d want to go on and on about something as mundane as instant coffee but if you’re a lightweight backpacker like me and absolutely are addicted to it, a great cup of coffee in the morning out in the backcountry that weighs almost nothing is something akin to being in heaven. I’ve tried most every way coffee can be made on the trail: cowboy style, French presses, coffee bags, okay instant (Taster’s Choice), really bad instant (everything else), coffee concentrate, and of them all, the cowboy version works best, but with it comes a lot of negatives: the coffee is heavier, you need a bigger pot to brew it in and then there’s the cleanup. Not having coffee at all, by the way, is absolutely not a choice. 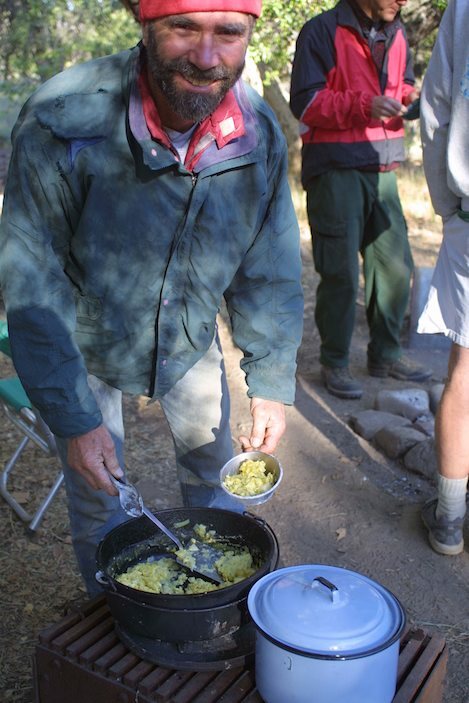 I still have in my memory – as vividly as if it happened yesterday – a trip with a teacher friend named Dave Weaver, who now enjoys retirement by working as a forest ranger, and another friend down the Sisquoc River. It was Christmas vacation, the trip six days total, and we were driven in to our starting point in Santa Barbara Canyon and were working our way over the Sierra Madres, along the Sisquoc and back up the Manzana to Nira where we’d dropped off a shuttle car a few days earlier. In those days we packed heavy and took most everything we thought we’d need and then some. For some reason Dave mentioned he’d bring the coffee and I didn’t think much more about it until the morning after we’d been dropped off and hiked down to Heath Camp where we spent the first night. Being an early riser, I was up at first light, got a fire going, and started boiling a quart of water, thinking Dave’d be up soon and the coffee would be on. A half hour later, a bit needy for my caffeine fix, I hear Dave stirring so I yell over, asking where the coffee is. More or less I can make out that it is in one of the outside pockets in his pack and that I’m welcome to rummage around for it. So I do. After opening the third pocket I hit pay dirt – or at least I think I do. Inside are a few assorted items and one large glass jar. I’m a little dismayed, realizing it’s not coffee: it’s instant. Not quite what I expected, but oh well. I’ll survive. Then I turn the label on the jar and I realize the label is green. Nasty. It’s not only instant, but it’s decaf as well. About this time I’m starting to wonder if this is it, or if there’s another stash hidden somewhere else I’ve missed. I meander over to Dave’s sleeping bag and inquire if perhaps he might direct me to where the hi-test stuff is located. Now Dave has this sheepish grin, which he displays at times like this when maybe he’s screwed up a bit. “That’s it,” he says. “That’s it,” I repeat, already starting to go through withdrawals and wondering how I’m going to make it through five more mornings just like this. Later, as we head out, I’ve got three cups of the decaf in me and it hasn’t made a dent in my need for caffeine. I more or less stumble my way down the Sisquoc. Every so often the spectacular beauty of the canyon gets my mind off the problem, which is where am I going to get my coffee fix. About 3 p.m. we reach the South Fork of the Sisquoc, where there is a small Forest Service guard station. About a quarter mile from the cabin I smell the smoke and as we reach the meadow where it is located I can see it coming out of the chimney. When we arrive at the doorstep I can smell the coffee brewing. Real coffee. Cowboy coffee. The fully leaded, totally hi-test stuff. There are two backpackers there, packs hanging and sleeping bags stretched out on the cots inside the cabin. They welcome us in and offer us a cup. I’m saved. Even better, they are even heavier packers than us. Alongside the stove is a two-pound tin of Folgers. It’s almost full and they’re only out for another few days. No problem, one of them says, find a plastic bag and fill it up. Yes! I will make it through the rest of the trip. Now I mention all of this because first, I’ve never, ever been on another backpacking trip – or anywhere in the outback for that matter – without bringing the coffee. No exceptions. Second, since that backpack trip in the late 1970s I’ve yearned for the perfect cup of backpacker’s coffee and I still haven’t found it – or at least not until I began hearing the promos for the new Starbuck’s VIA brand of instant coffee. “At last, there’s an instant coffee with the body and flavor of real Starbucks coffee,” the ad says. When they offer taste tests, I’m there in a jiffy. I’m able to tell which is the instant, but barely, and it’s really pretty good. My waitress provides me with a coupon for a cup of the real Starbucks coffee along with a dollar off coupon for the instant. So I decide to buy some and head over to the counter. That’s when I realize I can’t buy a jar of the VIA brand, just 3- or 12-packs sold at exorbitantly high prices, and not only that, it comes in these skinny little tubes that cost a buck apiece for three or 80 cents for the 12-pack. That’s for a tube of instant java good for about 8 ounces of coffee. Want a Venti-sized portion and you’re shelling out close to $3 a cup, not a bargain at all. I’m still waiting for that perfect cup of coffee. It’s been a 30-year-long journey but I’m almost there. Starbuck’s has created the coffee: lightweight to pack, easy to boil the water in small quantities and no cleanup. I’ll wait, however, to feel like I’ve reached heaven for the moment when I hear Starbucks is selling VIA by the jar, when I can measure my own amount of water, spoon in the amount I want and then savor the moment.